1. Special offers cannot be used at the same time. 2. You can only enjoy the special offer once. 3. You should pay deposit of two months for monthly payment. 4. You should pay deposit of one month for prepay. 5. We have the right to change the price without further notice. You can use the following way to pay for the rent. 1. Visit the office and pay through cash or cheque. 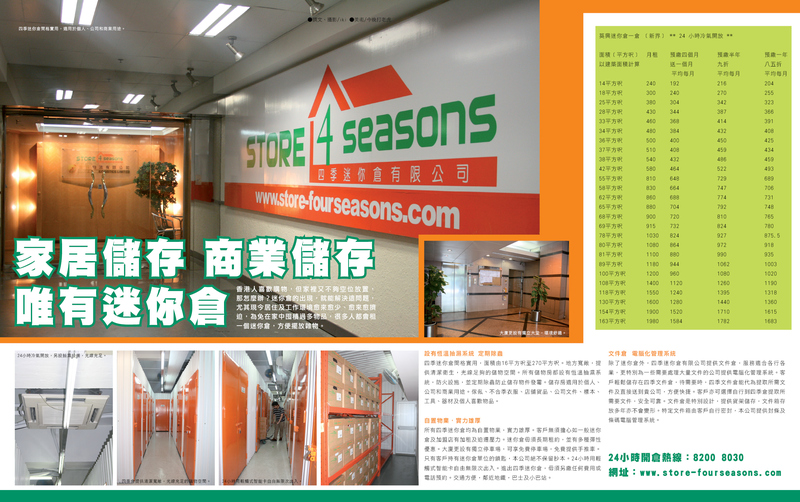 Address: Flat A-B & E, 4/F, Kwai Tak Industrial Centre, 15-33 Kwai Tak Street, Kwai Chung, N.T. 2. Deposit into bank account. Account Name: Store Four Seasons Ltd.
After recording please keep the bank slip and fax to our company (Fax: 2480 1263) and phone us to help following up.